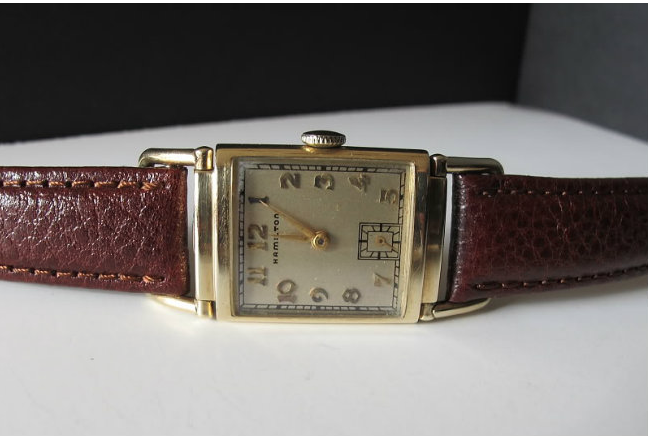 I recently picked up an interesting project watch. It's a non-running, Automatic K-451. 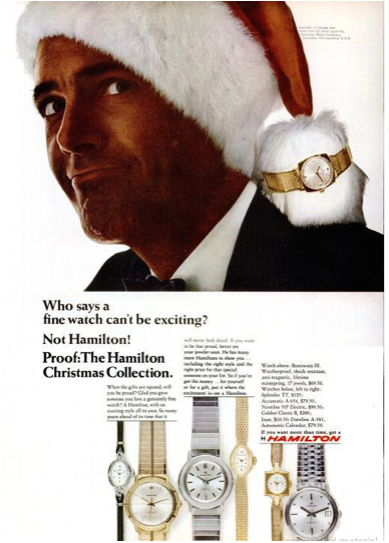 What makes it interesting is that it doesn't show up in any of the Hamilton catalogs. 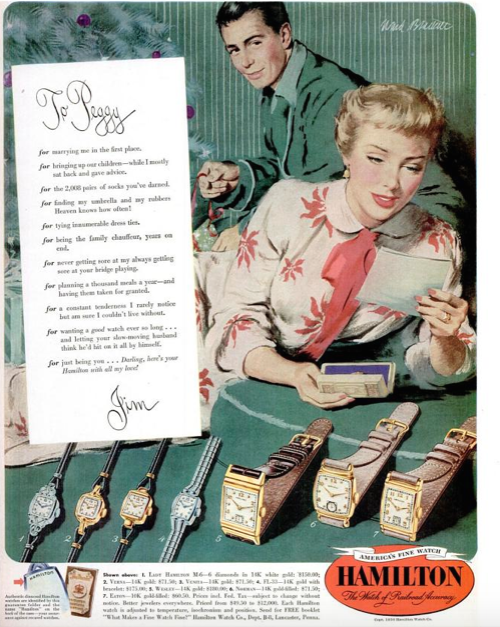 The K-450 was introduced in 1954 and the K-454 was introduced in 1955. The K-453 was introduced in 1957. There is no K-452 that I'm aware of. So when exactly the K-451 was introduced isn't really clear. My guess is 1955-ish. 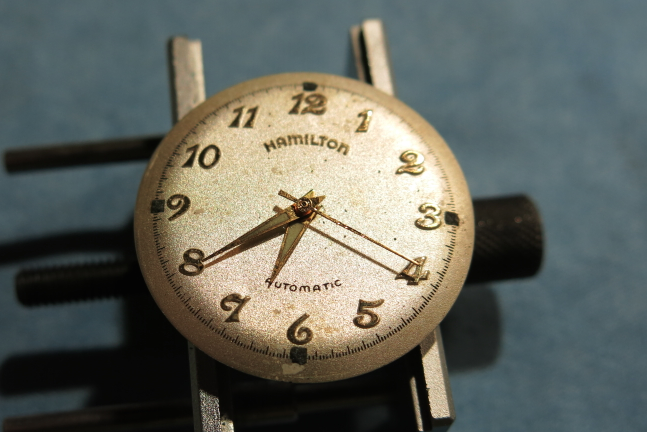 The dial is embossed with numerals as well as the Hamilton name. 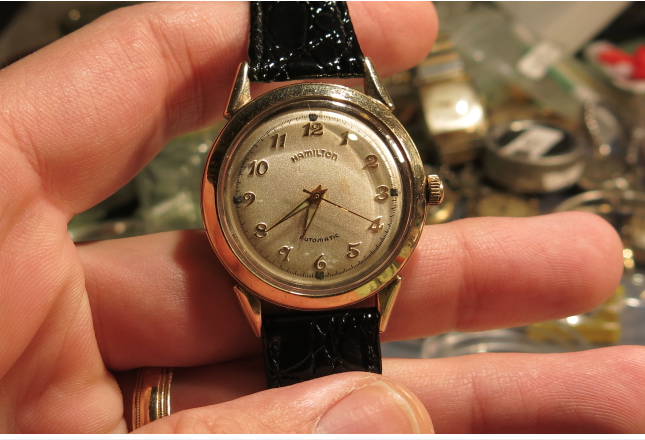 I believe my dial may be refinished, as the black squares at 12, 3, 6 and 9 don't look like they were printed very well. Perhaps they're supposed to be dots for luminous material, as the hands are lumed but nothing else is. 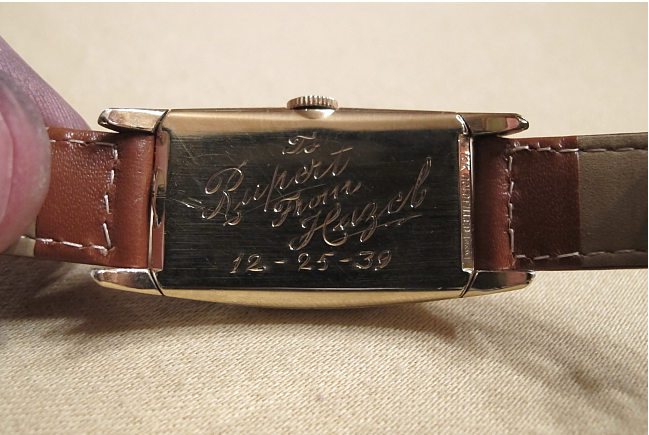 The two piece case has a 10K gold filled bezel with a screw on stainless steel back. 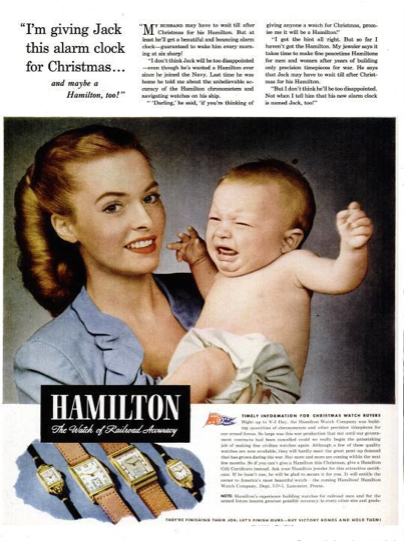 K-451 and the usual Hamilton logo, etc. is marked inside - so there's no doubt this is an authentic model. 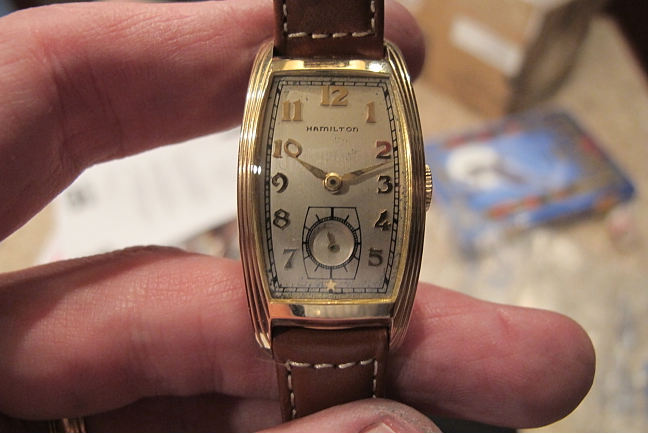 Behind the dial is a 17 jewel Hamilton 661 automatic movement. 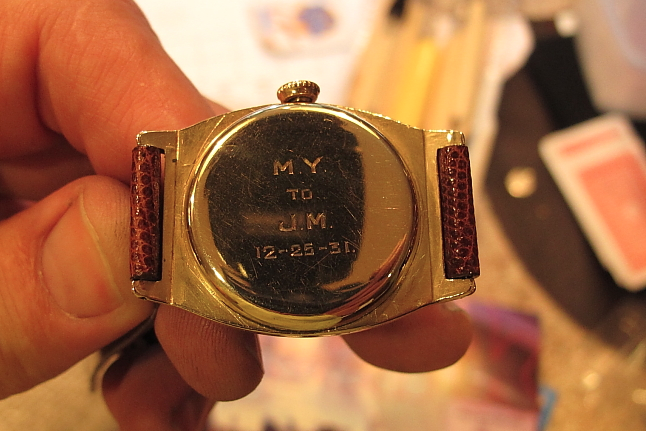 As received, this watch was dead on arrival. I knew it wasn't working when I bought it so I took a little bit of a chance that all it was going to need was a cleaning. I was glad to see that the balance staff was not broken. 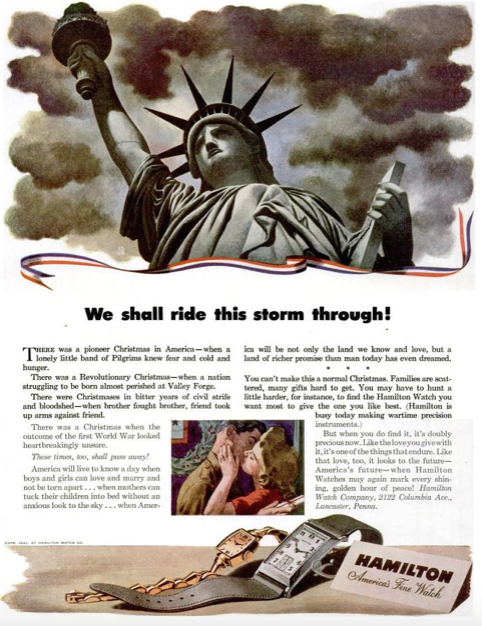 Most movements from the late 1950's on are "shock jeweled" to protect delicate pivots from accidental breakage. 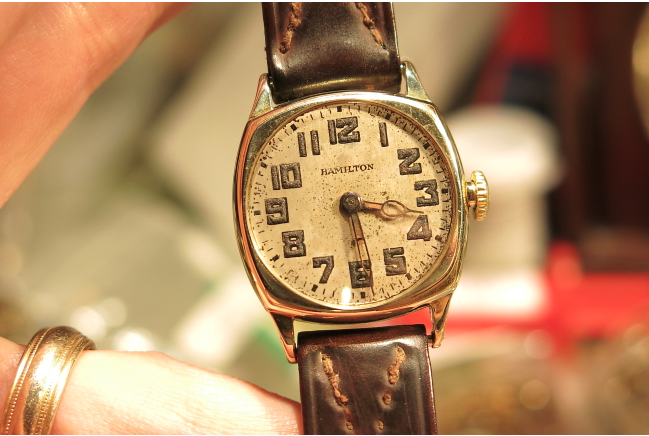 This watch's main problem was it was really, really dirty with a lot of rust inside too. Here's a shot of the stem. It needs to be removed in order to get the movement out of the case. I have spare stems but I don't have a spare crown so I will leave this stem as is and hope with cleaning and lubrication it will still be sound. With the stem removed there are two case screws that need to be removed in order to get the movement out through the back. 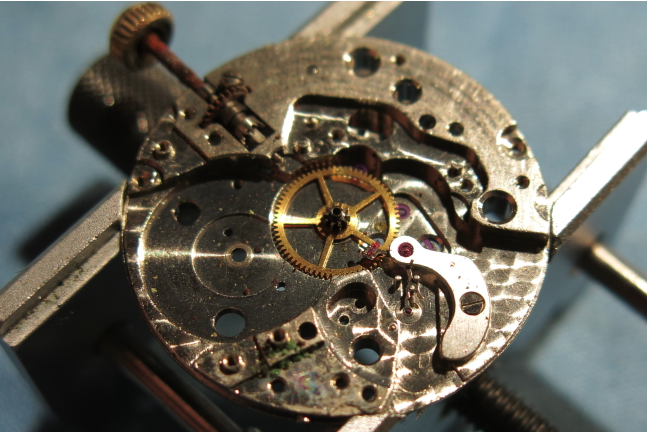 You can see the first one in the shot below along the circumference of the movement. The other is on the opposite side and is not visible as it's under the rotor. 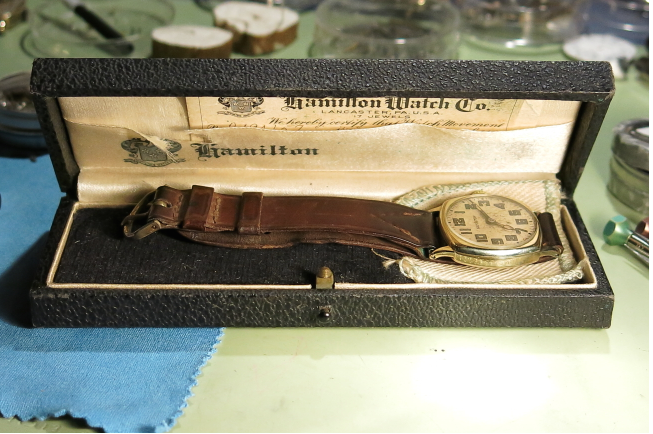 With the movement out of the case and in the movement holder, I can now pull the hands and the dial. 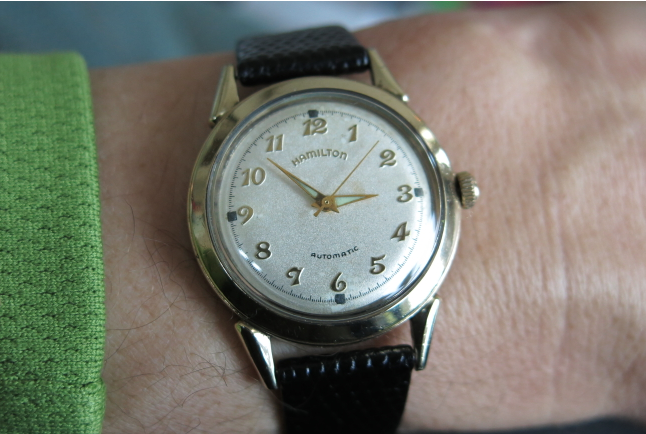 The dial is pretty dirty (like the rest of the watch) and it has some white spots. I'll try to clean it - but I don't want to lose the printing. Refinished dials can be very susceptible to printing loss when cleaned. 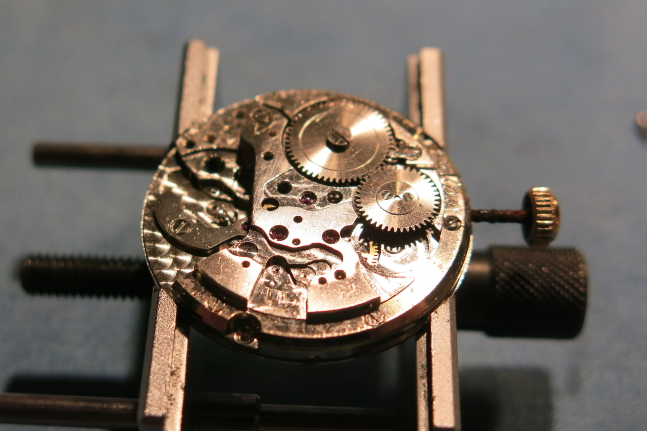 Under the dial, the movement is fairly typical. 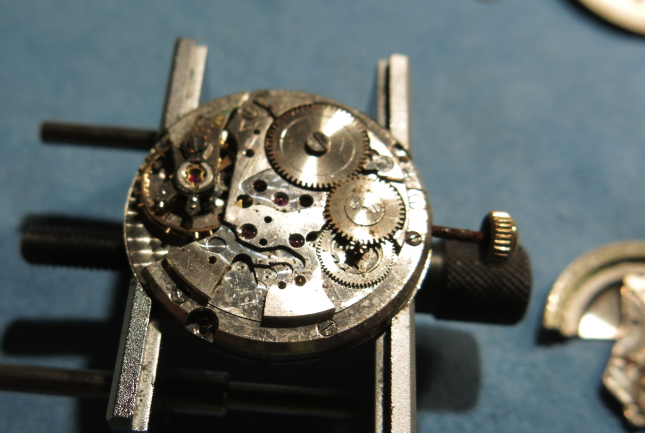 The hour wheel, cannon pinion and keyless works get removed in order to give the parts a good cleaning. 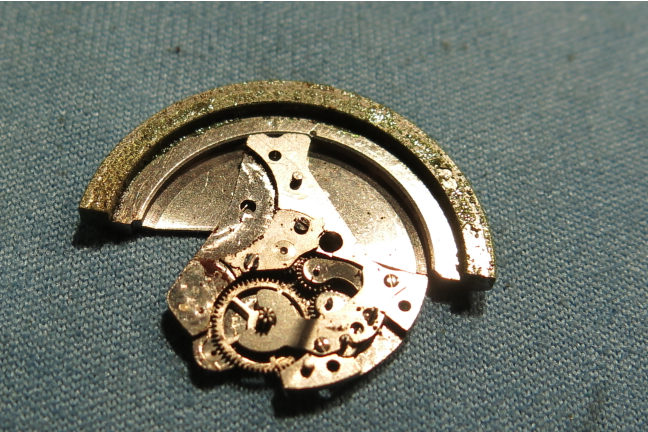 Here, most of the parts on the dial side are removed. 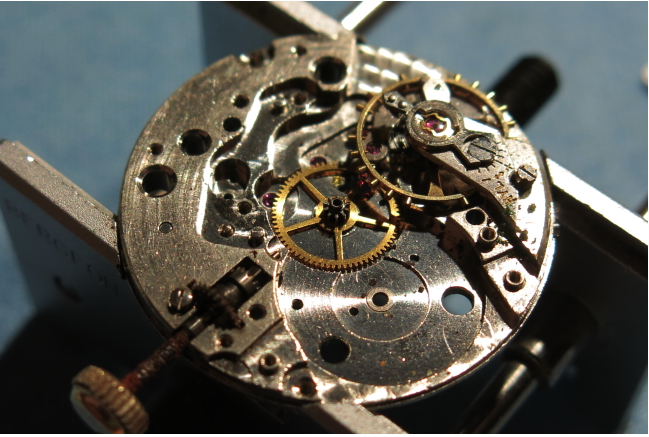 On the rotor side of the movement the first thing to come off is the rotor assembly. There are three screws that need to come out, then the rotor comes off in it's entirety. The underside of the rotor is a dirty, corroded mess. 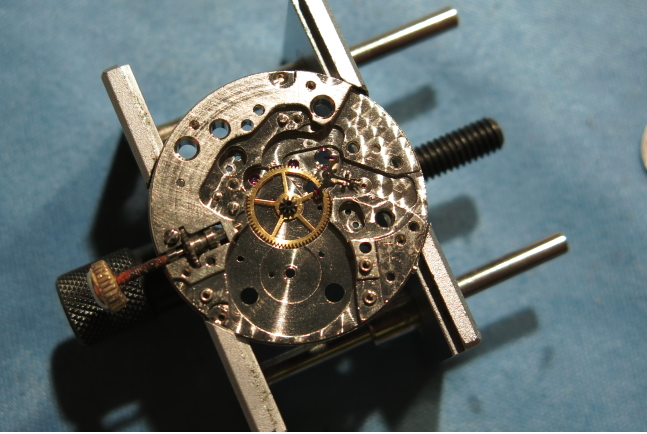 With the rotor removed this movement now looks like your typical Swiss mechanical movement. I was shocked to see all this dirt and grime inside. It's no wonder this watch stopped working. 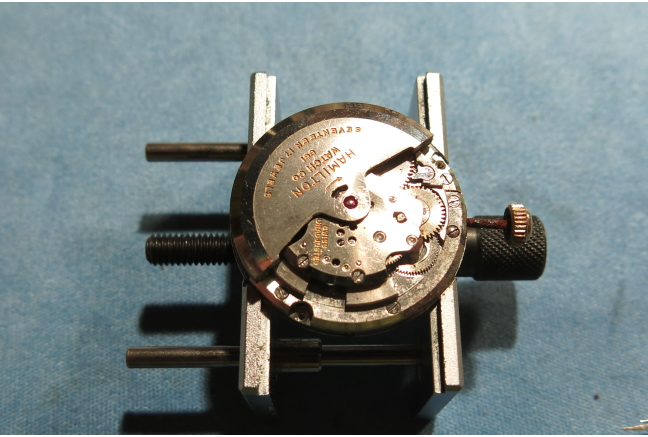 The next step is to remove any tension left in the mainspring and to pull the mainspring barrel. The larger wheel below is the ratchet wheel that drives the mainspring. 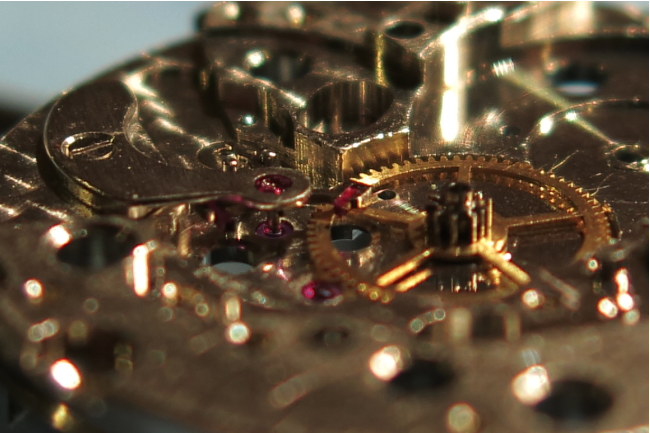 The crown wheel is below it and below that is a wheel that engages the rotor assembly and allows it to wind the watch. 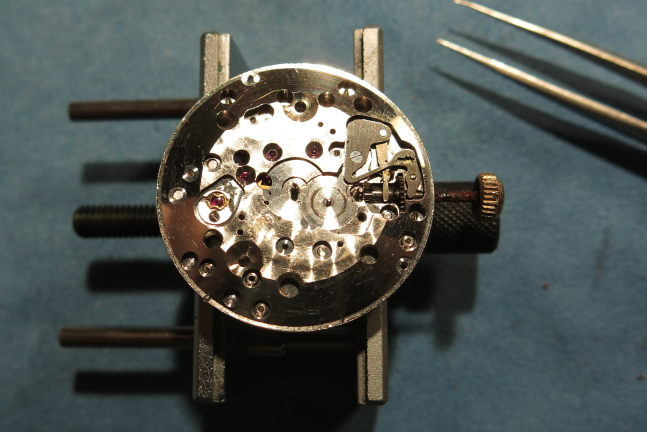 Here the mainspring barrel has been removed. 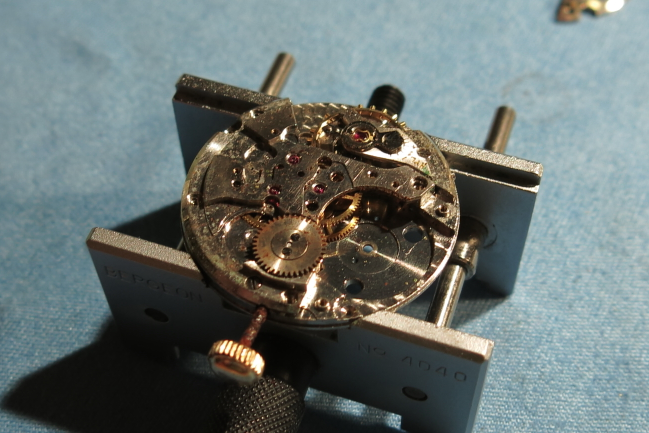 This movement is unique in that the train bridge includes the crown wheel (the part the stem turns to wind the ratchet wheel and mainspring). Four screws hold the train bridge on. With the train bridge removed, two of the wheels can be removed. The one in the center is the fourth wheel and drives the sweep second hand. The other wheel below that is the third wheel. With those wheels removed, there's another bridge underneath that holds just the center wheel. The escape wheel is blocked by this bridge, although it's not supported by it. Two screws hold the bridge in place. Once they're removed the bridge can come out as well as the escape wheel. Normally the center wheel is the first wheel out but in this movement it's blocked by the pallet fork. So the next thing to be removed is the balance assembly. With the balance out of the way, the pallet fork bridge and pallet fork can come out. One screw holds it in place. Finally the center wheel can be taken out and everything can go into the ultrasonic cleaner. 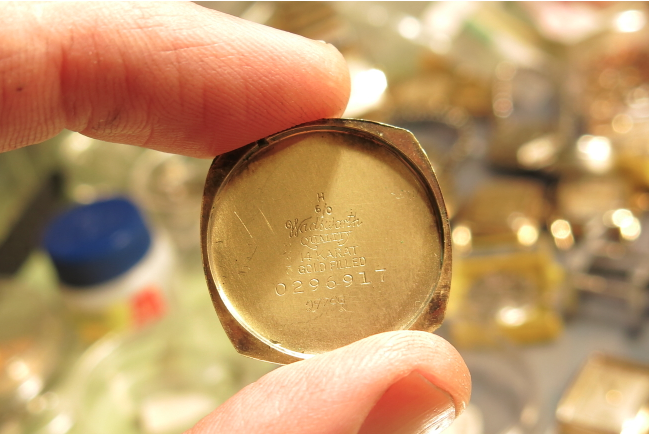 With everything cleaned and dried, the parts go back in place in the reverse order that they were taken out. So that means the center wheel and pallet fork go on first. It might be hard to make out in this photo but this is the angle that I look at the pallet fork to make sure that it's arbor (axle) lines up correctly with it's supporting jewels. It has to be lined up correctly or when you tighten the screw you can break off one of the pivots - then you're toast. You can see (maybe) the tip of the pivot sticking out of the ruby jewel indicating that everything is lined up. All the wheels go back in and the train bridge is reinstalled. Getting all the wheel axles to line up is tricky. It requires great patience and a gentle touch - not to mention a good magnification visor. The four screws go back in to hold it in place. 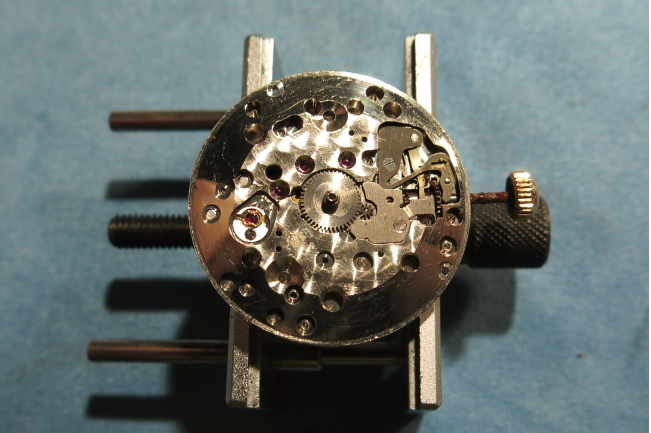 The mainspring barrel goes back in, along with it's bridge. 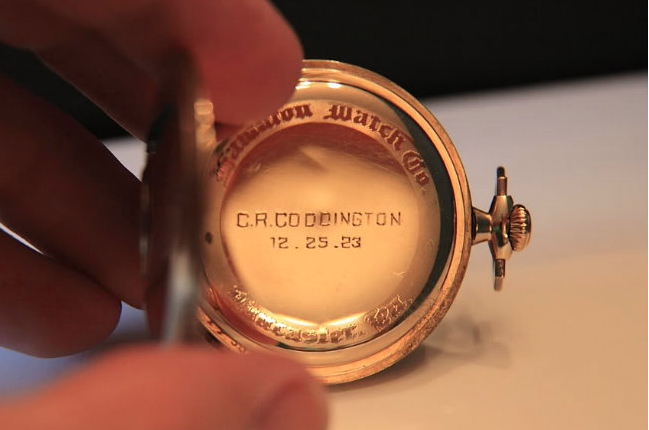 At this point you can wind the watch by the crown like a mechanical movement. I'll put the balance assembly on next, make sure the watch is running properly and then reinstall the cleaned up rotor assembly. With everything put back together and reinstalled in the freshly polished case, the Automatic K-451 is ready for some wrist time. The dial cleaned up well, I think. I'm not sure what the black squares are all about but I don't have a catalog image to compare it to... so this is as good as it's going to get. 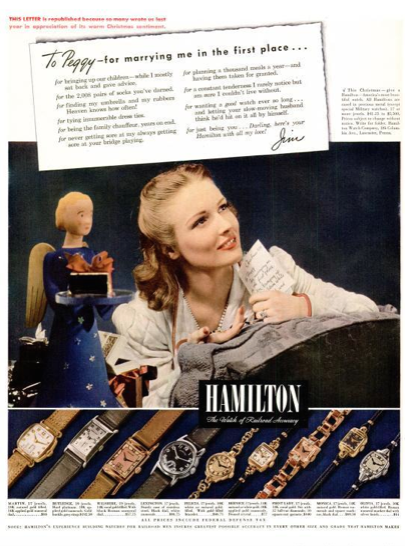 In 1924 Hamilton introduced the first 6/0 sized wrist watch for men... the Cushion. 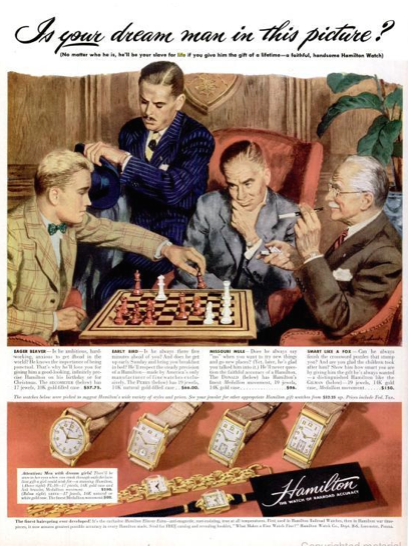 In another year or so a second wrist watch would be available - the Square. 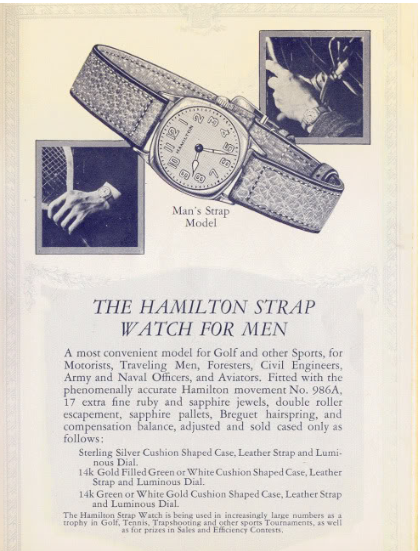 But for 1924 the choice was simple... the "Man's Strap Model". 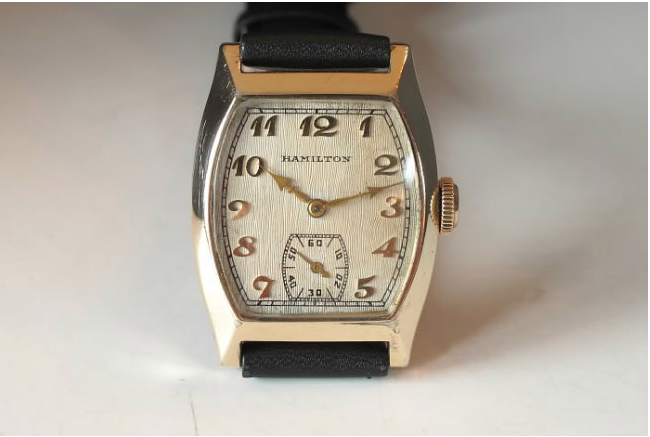 The Cushion has a three-piece case, typical for this time period, where the crystal is held in a front bezel, the movement is held in the center, and the back cover enclosed the case center. 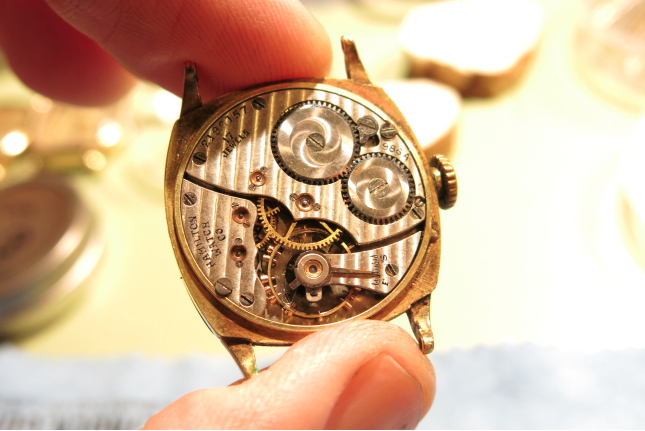 In order to remove the movement you have to take off the bezel, then remove the stem and the two case screws from the back. Then the movement comes out the front of the case center. The Cushion came in solid green or white gold as well as gold filled in the same colors. 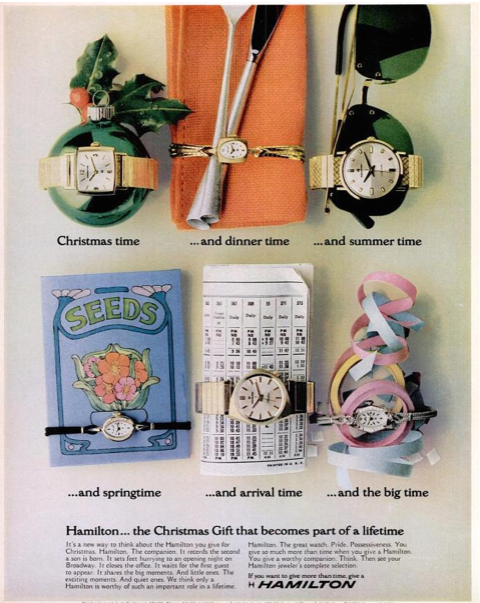 It's also one of the very few watch models that was available in silver. 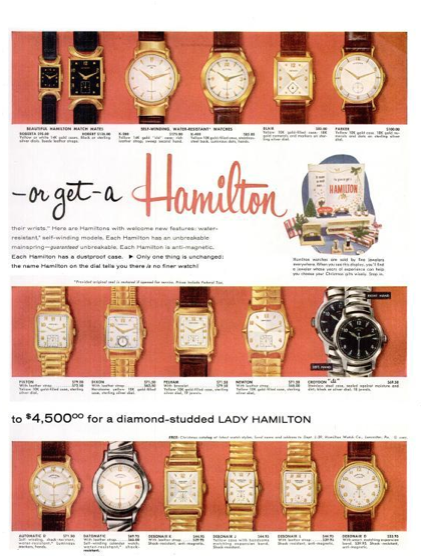 Dials were typically luminous designs. 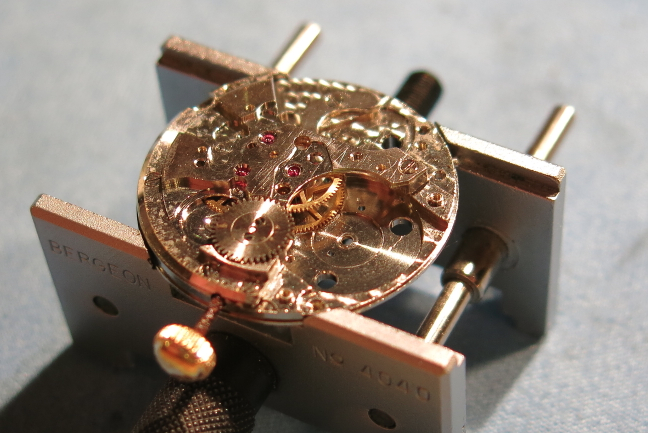 The principle movement you'll find in a Cushion is the 17 jewel 986A. This movement has no seconds hand. 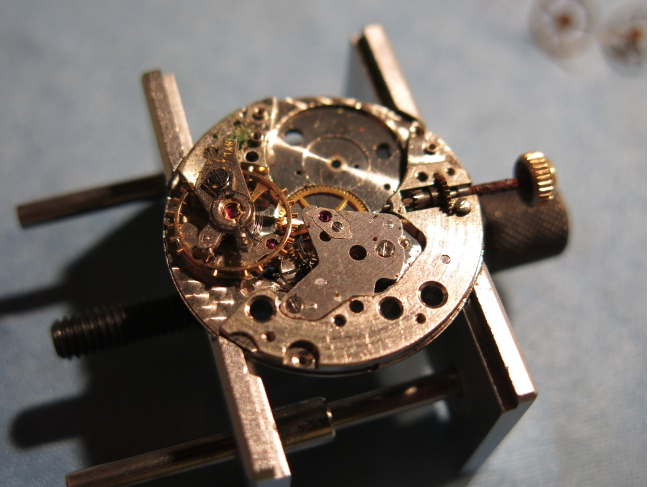 You might occasionally find a 986 movement and a dial with a "seconds at 9" sub second register. 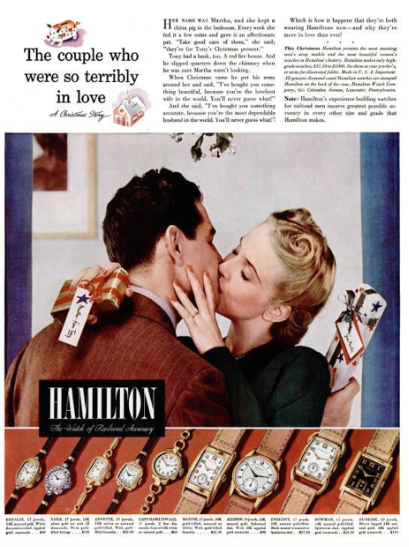 The 986 was a ladies pocket watch movement. 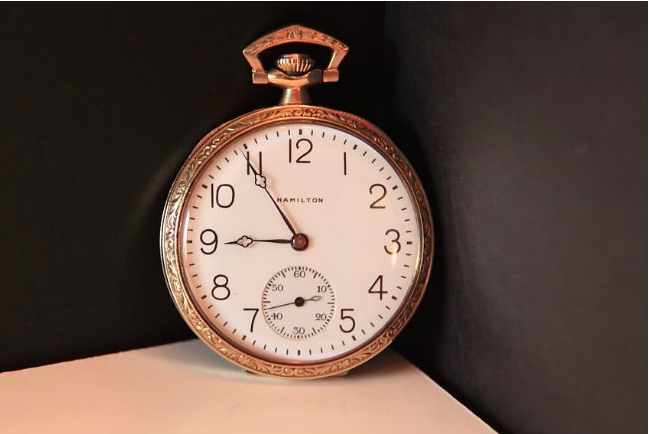 When rotated 90 degrees to accommodate a stem at the 3, the seconds register moves to 9. 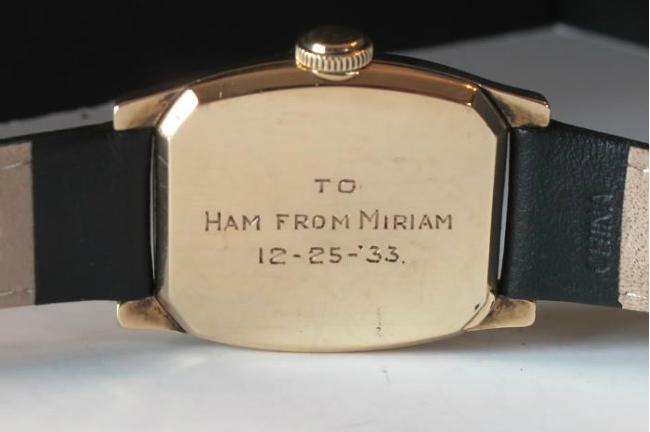 A friend of mine recently sent me one of his project watches - and it was a real "diamond in the rough" as they say. It came in it's original blue box with cardboard outer box too. As received, it was missing it's crystal and was not running. 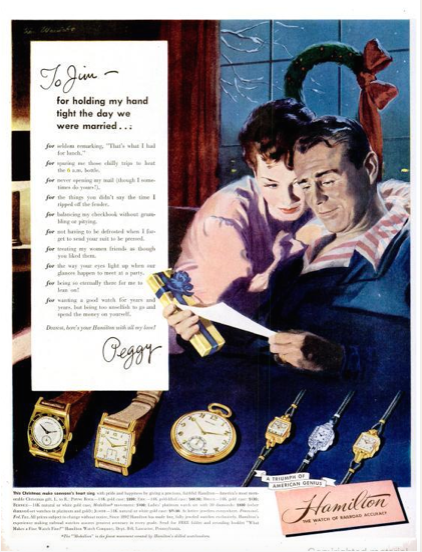 The lume had also partially fallen off the hands. 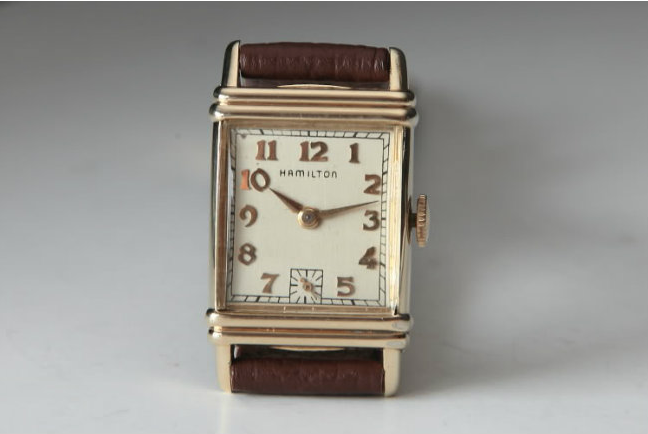 This Cushion design was reproduced during WWII when Hamilton sold excess 1920's movements in 10K gold filled cases. 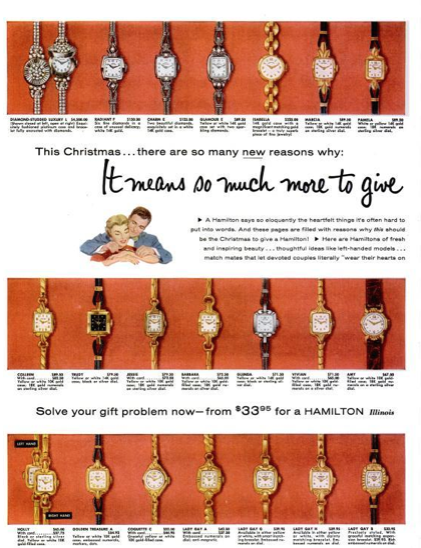 986A and 986 movements were used for these watches. 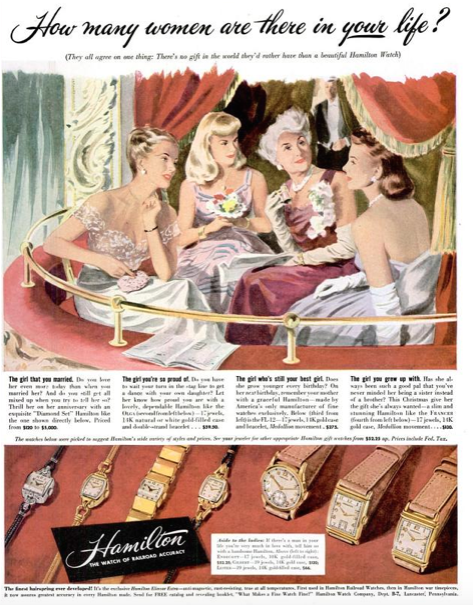 The easiest way to tell if a Cushion is a 1920's model or a 1940's model is to look at the case material. 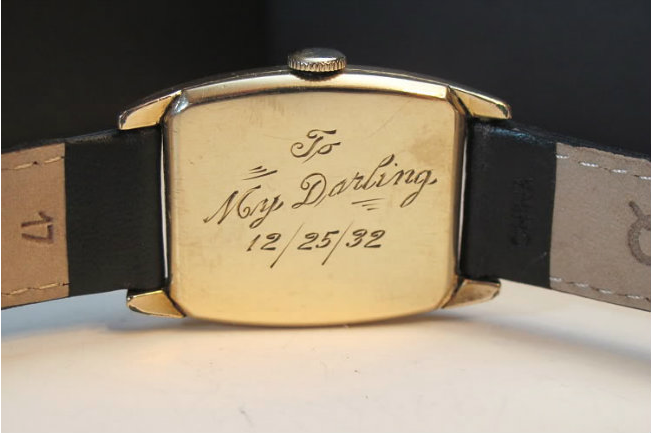 As you can see below, this case back is 14K gold filled. A quick look at the movement revealed that it was pretty dirty. 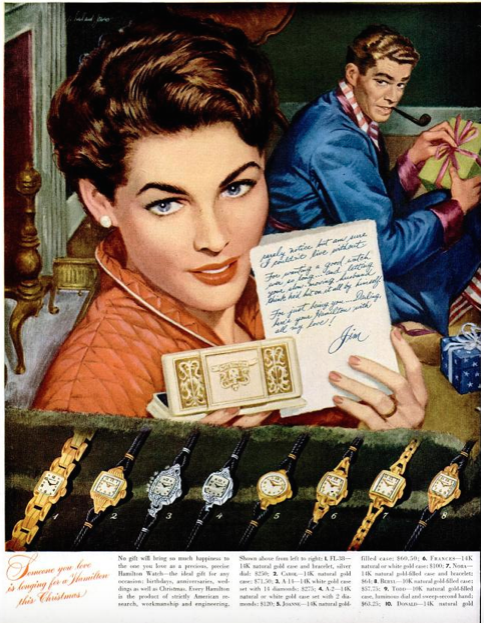 Dirt is a common reason a watch will stop running. 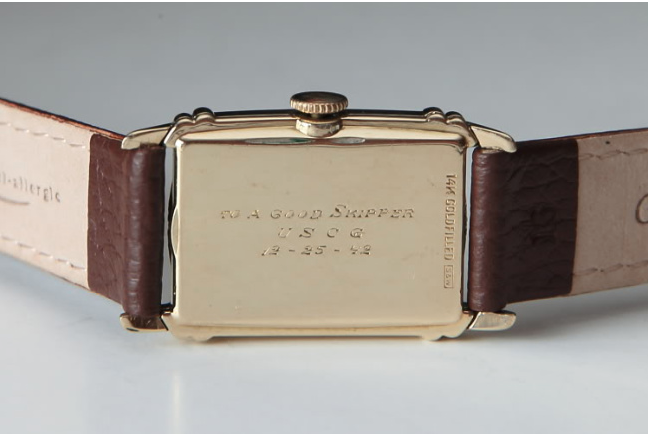 However, this watch also had a broken balance staff. The balance staff is the axle for the balance assembly - that's the part that rotates back and forth and allows the watch to keep time. If the balance wobbles at all it's quite likely one of the balance staff pivots is broken or worn away. 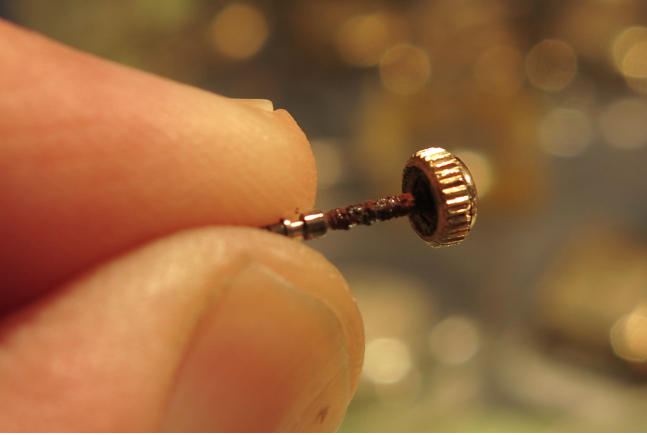 Like all the wheels, the axles have tiny well-formed points on the ends that ride in the jewels. 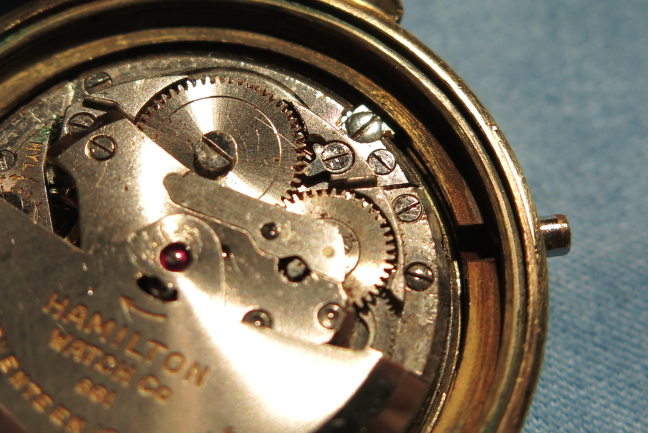 These points are called "pivots" and they can be easily bent or broken by mishandling the movement or dropping the watch. Changing a balance staff requires specialized tools in addition to experienced hands. The tools are quite expensive and on my "to buy someday" list. So - my only solution for a broken balance staff is to take a complete balance assembly from a donor movement. 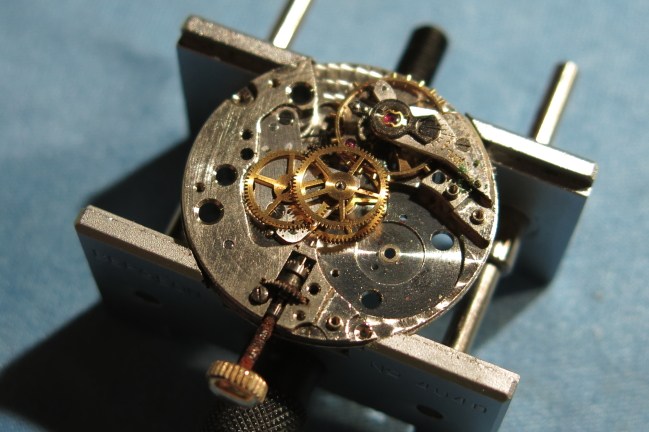 I'll spare you the blow-by-blow disassembling, cleaning and re-assembling of the watch movement - but it goes like any of the other overhauls I've posted. While everything was in the ultrasonic, I shaped a new domed glass crystal to fit the bezel opening and polished the case. 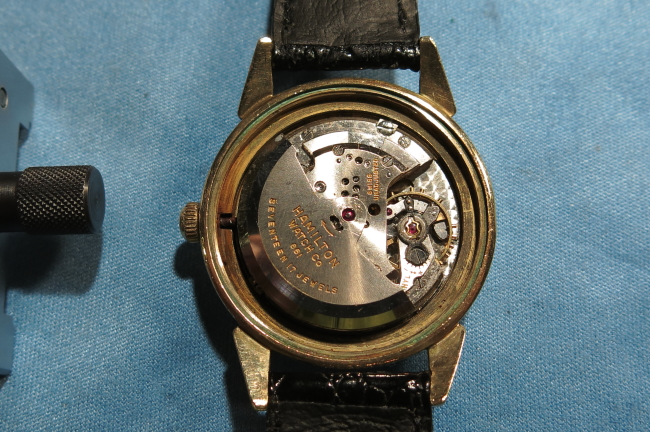 The mainspring was also "set" so I replaced it with a new mainspring to give this watch plenty of new life. Once the new "donor" balance assembly was installed everything was reassembled and it's ready to go back into regular service. I left the hands as is - as putting fresh lume on an old dial looks like new shoe laces on a pair of old sneakers... pretty silly. 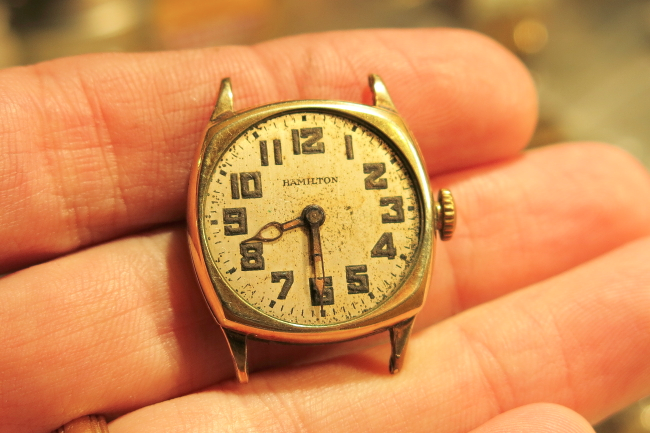 I also think semi-skeleton hands on an old dial gives the watch an authentic vintage look. For 2000 years Christians have marked the anniversary of Christ's birth with celebration. 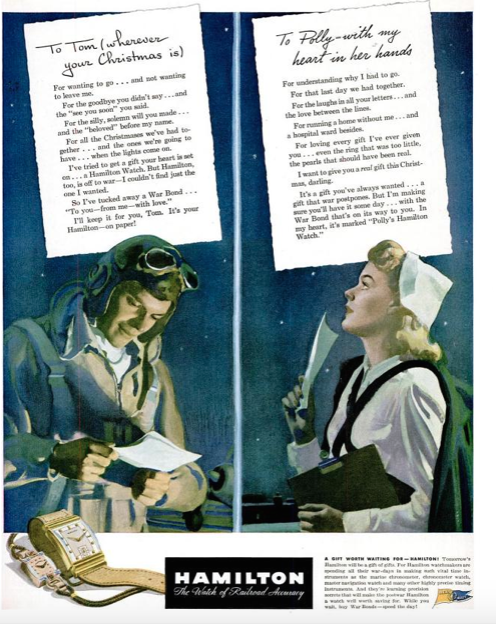 In modern times the celebration has included the giving of special gifts to loved ones. 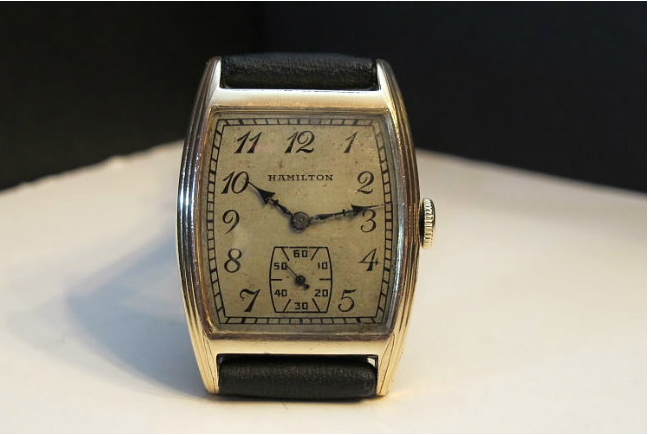 Receiving a Hamilton watch - especially during the Great Depression - was definitely something special and you can gage how much they were cherished by how worn-through the cases became. 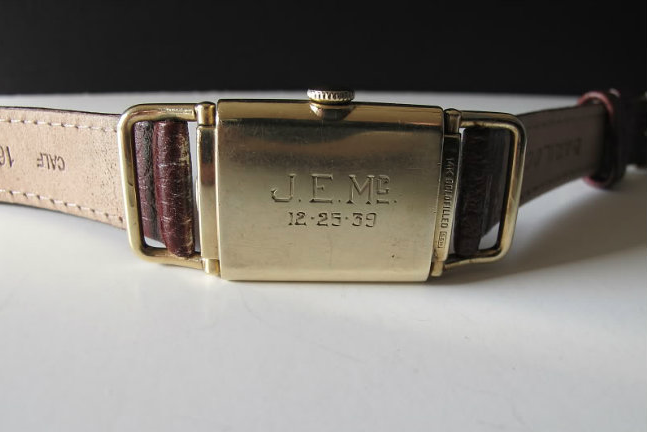 This is a family piece given to a great aunt, I suspect by her husband. 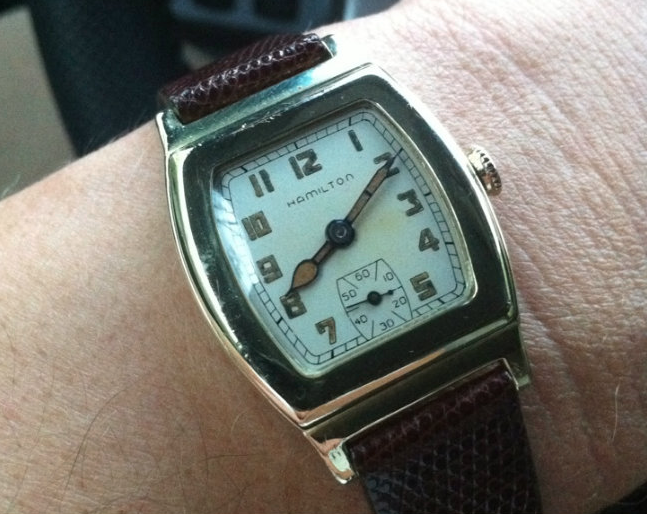 A 1932 Webster with enamel dial. 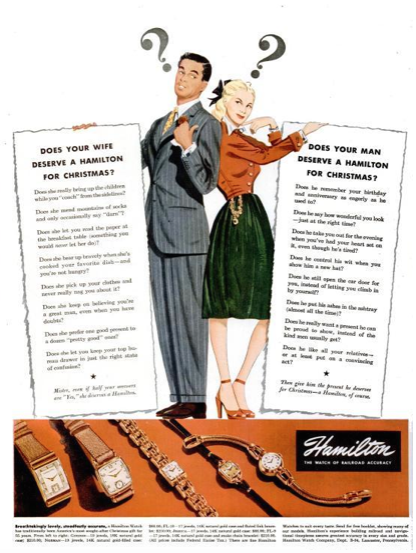 I find it fascinating to see how Hamilton marketed watches throughout it's history. 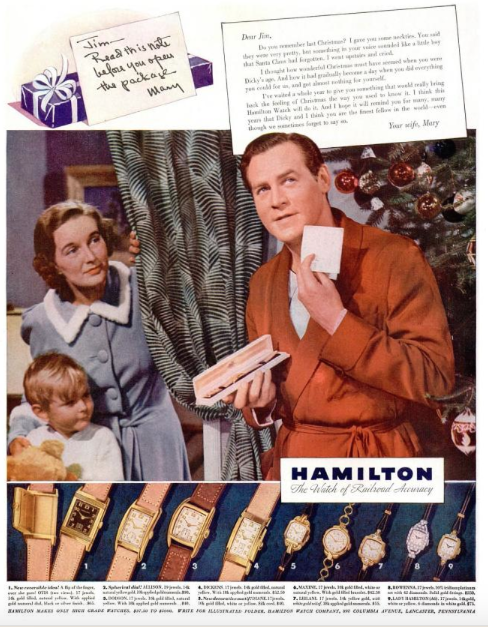 You can readily find Hamilton advertisements in Life Magazine. 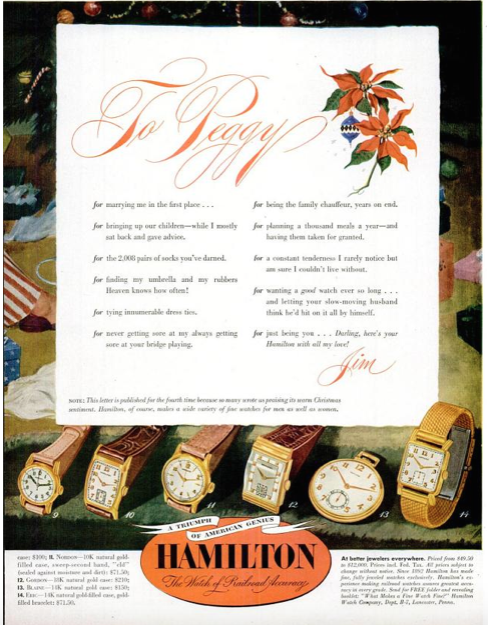 They really pulled out the stops during the holiday season as well as in Spring for high school and college graduations. 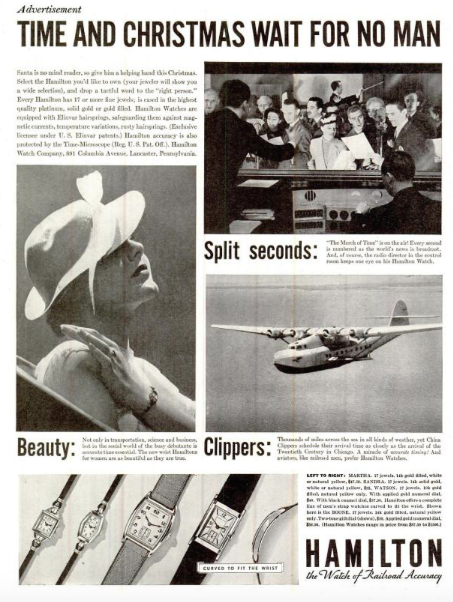 Check out these examples - starting with December 1936 and ending with December 1966.